Gas Mask Watcher, Watcher, Watcher, Watcher: Are you a Watcher? Or a Player? With great internet power comes great irresponsibility. 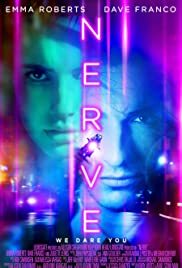 This is the premise behind "Nerve", a film whose producers must have wet themselves with excitement that the Pokemon Go craze aligned so nicely with the release of their film. I was delighted that at last this summer there is a film with a modicum of originality I can enthuse about. but "Bail" or "Fail" and you lose all. And "snitches get stitches". What is so impressive about this film is that the screenplay by Jessica Sharzer (based on a novel by Jeanne Ryan) is genuinely original and is delivered with style and good humor. Sure, you can draw parallels for any film with many other sources: in here there are traces of Hunger Games/Allegiance; the "Simon Says" portion of Die Hard 3; perhaps a soupçon of "Gladiator" and Schwartznegger's "Running Man" in the mix. But this is a novel approach to a teen flick, bang on the topical money in bringing in the frenetically viral nature of social media and aspects of the 'dark web', cyber security and open source programming. The film manages to generate significant credibility about the impact that a game like this would have among a teen audience. And there is a telling message in the finale: that it is easy to be a troll without responsibility hiding behind an internet ident, but when the masks come off and the message back becomes personal then your responsibilities as an individual human can come home to roost. The film is delivered with style and verve as well, with innovative graphics (a great title and end title design) and an 'augmented reality' overlay of the action showing Players and Watchers across the city. Many of the challenges are executed really well, with a few seat-clenchingly tense moments, particularly if you have a poor head for heights. But with all this potential it unfortunately fails to be a 10* classic, smelling at times of 'B' movie. Which is a great shame. Emma Roberts is fine at what she does, but at times I longed for the dramatic depth of a Shailene Woodley or Chloe Grace Moretz, with the scenes with the under-used but excellent Juliette Lewis rather highlighting this differential. The otherwise excellent script is – for me – let down by a scene of male-on-female violence which I found both distasteful and unnecessary. And a coding 'geeks shall inherit the earth' moment towards the end is a little too glib for my liking. But overall the directors Henry Joost and Ariel Schulman ("Paranormal Activity 3" and "4") have done a fine job with a $20M budget. Regular readers of my blog (bob-the-movie-man.com) may recall my use of the "BvS quotient" – the number of films that could be made from the budget of "Batman vs Superman": this one has a BvS quotient of 8% meaning you could make over 12 of these instead of the superhero dud. Yes please! Although if they had doubled the budget and rounded off some of the sharp corners, this could have been a true classic. It's still recommended for a memorable movie experience though, and probably makes it into my draft movies of the year list so far. (For the graphical version of this review and to comment, please visit bob-the-movie-man.com. Thanks). 68 of 119 people found this review helpful. Was this review helpful to you?